A holistic and comprehensive account of the nature of the transition from hunting to farming in prehistory. It addresses for the first time the main bioarchaeological aspects such as changes in mobility, behaviour, diet and population dynamics. This book is of major interest to the relevant audience since it offers for the first time a global perspective on the bioarchaeology of the transition to agriculture. It includes contributions from world-class researchers, with a particular emphasis on advances in methods (e.g. ancient DNA of pathogens, stable isotope analysis, etc.). Changes in behaviour which can be reconstructed from the study of the skeletal record. These include changes in activity patterns, sexual dimorphism, evidence of inter-personal trauma, and the like. Population dynamics and microevolution by examining intra and inter population variations in dental and cranial metric traits, as well as archaeogenetic studies of ancient DNA (e.g. mtDNA markers). Dr Ron Pinhasi, Lecturer in Prehistoric Archaeology, Department of Archaeology, University College Cork, Cork. Jay T. Stock, University Lecturer in Human Evolution and Development, Fellow of Downing College, Director of Studies in Archaeology & Anthropology, Assistant Director of the Duckworth Laboratory. 1. 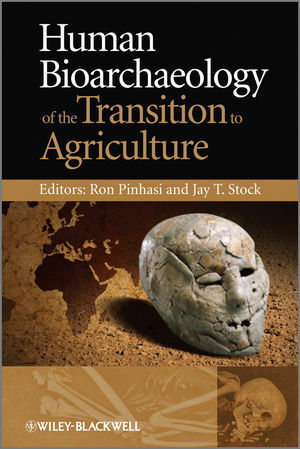 Introduction: Changing Paradigms in Our Understanding of the Transition to Agriculture: Human Bioarchaeology, Behaviour and Adaption (Jay T. Stock and Ron Pinhasi). 2. Mesolithic-Neolithic Transitions: An Isotopic Tour through Europe (Rick Schulting). 3. The Mesolithic-Neolithic Transition in Eastern Europe: Integrating Stable Isotope Studies of Diet with Palaeopathology to Identify Subsistence Strategies and Economy (Malcolm Lillie and Chelsea Budd). 4. Climatic Conditions, Hunting Activities and Husbandry Practices in the Course of the Neolithic Transition: The Story Told by Stable Isotope Analyses of Human and Animal Skeletal Remains (Gisela Grupe and Joris Peters). 5. Health, Diet and Social Implications in Neolithic Greece from the Study of Human Osteological Material (Anastasia Papathanasiou). 6. Using a Bioarchaeological Approach to Explore Subsistence Transitions in the Eastern Cape, South Africa during the Mid- to Late Holocene (Jaime K. Ginter). Section B: Growth and Body Size Variation. 7. Long Bone Length, Stature and Time in the European Late Pleistocene and Early Holocene (Christopher Mieklejohn and Jeff Babb). 8. Variability in Long Bone Growth Patterns and Limb Proportions Within and Amongst Mesolithic and Neolithic Populations from Southeast Europe (Ron Pinhasi, S. Stefanovic, Anastasia Papathanasiou and Jay T. Stock). 9. Reaching Great Heights: Changes in Indigenous Stature, Body Size and Body Shape with Agricultural Intensification in North America (Benjamin M. Auerbach). 10. Evolution of Postcranial Morphology during the Agricultural Transition in Prehistoric Japan (Daniel H. Temple). Section C: Biomechanics and Indicators of Habitual Activity. 11. The Bioarchaeology of Habitual Activity and Dietary Change in the Siberian Middle Holocene (A.R. Lieverse, Jay T. Stock, M.A. Katzenberg and C.M. Haverkort). 12. 'An External Agency of Considerable Importance': The Stresses of Agriculture in the Foraging-to-Farming Transition in Eastern North America (Clark Spencer Larsen and Christopher Ruff). 13. Mobility and Lower Limb Robusticity of a Pastoralist Neolithic Population from North-Western Italy (Damiano Marchi, Vitale Sparacello and Colin Shaw). 14. Body Size, Skeletal Biomechanics, Mobility and Habitual Activity from the Late Palaeolithic to the Mid-Dynastic Nile Valley (Jay T. Stock, Matthew C. O'Neill, Christopher B. Ruff, Melissa Zabecki, Laura Shackelford and Jerome C. Rose). Section D: Archaeogenetics, Palaeodemography, Cranial and Dental Morphology. 15. The Palaeopopulationgenetics of Humans, Cattle and Dairying in Neolithic Europe (Joachim Burger and Mark G. Thomas). 16. The Genetics of the Neolithic Transition: New Light on Differences Between Hunter-Gatherers and Farmers in Southern Sweden (Anna Linderholm). 17. Palaeodemography of Southern Levantine Pre-Pottery Neolithic Populations: Regional and Temporal Perspectives (Vered Eshed and Ehud Galili). 18. Skeletal Differentiation at the Southernmost Frontier of Andean Agriculture (Marina L. Sardi and Marien Beguelin). 19. Dental Reduction and the Transition to Agriculture in Europe (Ron Pinhasi and Christopher Meiklejohn).